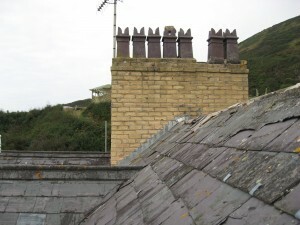 Here in West Wales properties often have the combination of substantial weather and aged chimneys, this can result in persistent dampness surrounding the chimney breasts just below ceiling level of the upper floors. 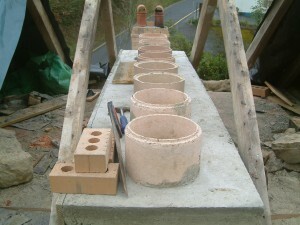 There are a number of fixes available to repair chimneys and in some cases a repair is straight forward. 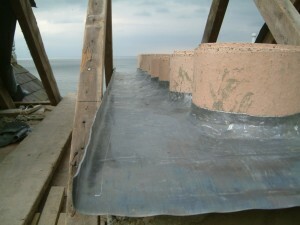 However in some cases rebuilding the chimney incorporating a lead damp proof course/tray is the best long term solution. To see if your chimney can be repaired or needs to be rebuilt see the heading below “Should you rebuild a leaky chimney stack?”. We have had many years of repairing & rebuilding chimneys at Hayday Construction and routinely offer the service throughout our local area. 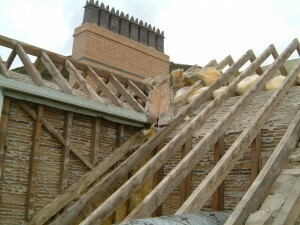 We can fix your chimney promptly and professionally. 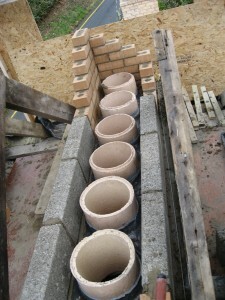 Should you rebuild a leaky chimney stack? Every year we rebuild many old stone chimney stacks as they are the most exposed part of the property. 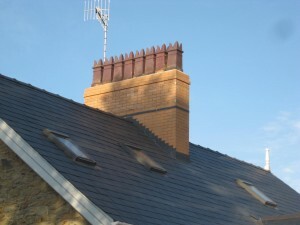 Chimney stacks are subject to being soaked by driving rain, eroded by wind and frequently suffer expansion and contraction wear and tear. The result of all this is that the old lime and clay based mortars around the stones or bricks breaks down, leaving the stones, bricks and mortar loose to the core. Once the stones have become loose inside re-pointing and painting or rendering the surface is often a waste of money because of the daily thermal movement of stones/bricks crack the new work at stone to mortar joins. Sometimes re-pointing or rendering is all that is required but this cannot be guaranteed. Clients could have two chimneys re-pointed and rendered one year (costing £500-600 plus scaffolding fee’s) only to be back to damp chimney breasts the following year. Often it is best to skip the attempts to remedy the problem via pointing, rendering, painting and applying silicone liquid etc. and put the money towards fixing the chimney’s core problem once and for all. The lead tray is really there as a backup so that should any water find its way into the chimney stack it will not be able to penetrate downwards. A newly built chimney stack incorporating a lead tray is guaranteed problem free for 20 years but will probably last over 100 years.